Sara "Orange Pearl Mermaid Princess"
Mermaid Princess of the Indian Ocean and keeper of the orange pearl. She joins Gakuto in his quest to take over the marine world after an incident bestowed her a dark power, turning both her orange hair and her orange pearl pitch black (though her eyes stay orange) and destroying her own kingdom. That incident was a proposed rendezvous with Tarō, her secret human lover, in which he never showed up. (In the manga, he actually arrived before, but Sara's guardian found out about the relationship and insisted that he leave, convincing Sara that he had abandoned her.) In a fury, Sara unleashed a wave of power, destroying her kingdom and causing the wave which killed Kaito's parents and from which Lucia saved Kaito. In the manga, her villain name is Black Pearl Voice and she transforms into an idol in a black dress reminiscent of a diva. However, in the anime, she does not transform until she turns good, and instead has the power to sing offensively in a humanoid, amphibious form like the villains and mermaid idols, with or without her E-pitch. In the end, she decides to join the other mermaids as is her duty. She, herself, seals the gate to Gakto's castle in the book because it's her duty and she unsealed the gate after her kingdom was destroyed. In the TV show, Aqua Regina seals the gate and Sara goes with Gaito because she loves him. She also appears in the second season as a spirit, informing Lucia of the future Orange Pearl Voice and offering her assistance where she can. 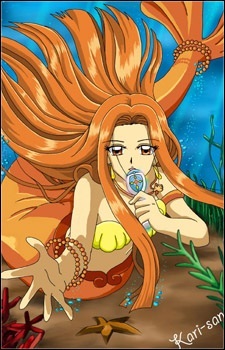 Sara is also seen singing with the other mermaid princesses in the very last episode of Mermaid Melody Pichi Pichi Pitch Pure.